The Battle of Guilford Court House was a battle fought on March 15, 1781 in Greensboro, the county seat of Guilford County, North Carolina, during the American Revolutionary War. A 2,100-man British force under the command of Lieutenant General Charles Cornwallis defeated Major General Nathanael Greene’s 4,500 Americans. The British Army, however, sustained such heavy casualties that the result was a strategic victory for the Americans. Despite the relatively small numbers of troops involved, the battle is considered pivotal to the American victory in the Revolution. 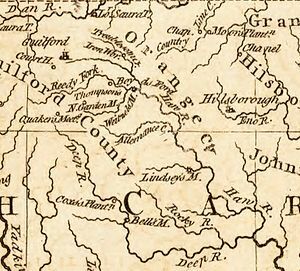 Before the battle, the British appeared to have had great success in conquering much of Georgia and South Carolina with the aid of strong Loyalist factions, and thought that North Carolina might be within their grasp. In fact, the British were in the process of heavy recruitment in North Carolina when this Battle (for all intents and purposes) put an end to their recruiting drive. In the wake of the battle, Greene moved into South Carolina, while Cornwallis chose to march into Virginia and attempt to link up with roughly 3,500 men under British Major General Phillips and American turncoat Benedict Arnold. These decisions allowed Greene to unravel British control of the South, while leading Cornwallis to Yorktown and eventual surrender to Major General George Washington and Lieutenant General Comte de Rochambeau. The battle is commemorated at Guilford Courthouse National Military Park. Following the Battle of Cowpens in South Carolina, Lt. General Charles Cornwallis was determined to destroy Greene’s army. But the loss of his light infantry at Cowpens led him to burn his supplies so that his army would be nimble enough for pursuit. He chased Greene in the “Race to the Dan”, but Greene escaped across the flooded Dan River to safety in Virginia. Cornwallis established camp at Hillsborough, foraged for supplies and recruited North Carolina Tories. However, the bedraggled state of his army and Pyle’s massacre deterred Loyalists from turning out. Due to the fighting, thousands of slaves had escaped from plantations in South Carolina and other southern states, many joining the British to fight for their personal freedom. In the waning months of the war, the British evacuated more than 3,000 freedmen to Nova Scotia, with others going to London and Jamaica. Northern slaves escaped to the British lines in occupied cities such as New York. On March 14, 1781, while encamped in the forks of the Deep River, Cornwallis was informed that Greene was encamped at the Guilford Court House. With him was a body of North Carolina militia, plus reinforcements from Virginia, consisting of 3,000 Virginia militia, a Virginia State regiment, a corps of Virginian eighteen-month men and recruits for the Maryland Line, totaling between 4,000-5,000 men. Cornwallis decided to give battle, though he had only 1,900 men at his disposal. He detached his baggage train, 100 infantry and 20 cavalry under the command of Lieutenant Colonel Hamilton, to Bell’s Mills further down the Deep River. Before breakfast could be eaten, Cornwallis set off with his main force, arriving at Guilford at midday. The advance guard met near the Quaker New Garden Meeting House. Dragoons from Banastre Tarleton’s British Legion were briefly engaged by Light Horse Harry Lee’s Dragoons about 4 miles (6 km) from the Guilford Court House. The British 23rd Regiment of Foot sent reinforcements forward and Lee withdrew, ordering a retreat to Greene’s main body. Cornwallis found the Americans in position on rising ground about one and a half miles (2.5 km) from the court house. He was unable to gain much information from his prisoners or the local residents as to the American disposition. To his front he saw a plantation with a large field straddling both sides of the road, with two more further over on the left separated by 200 yards or so of woodland. To his right beyond the fields the woodland extended for several miles. On the far side of the first field was a fenced wood, 1 mile (1.6 km) in depth, through which the road passed into an extensive cleared area around the court house. Along the edge of this woodland was a fence forming the American first line of defense and a six-pound cannon on each side of the road. Greene had prepared his defense in three lines. North Carolina militia formed the first line, with backwoods riflemen on the left and right flanks to snipe advancing British. In the second line, he placed the Virginia militia. Two more six-pound cannons were sited in the center of the line. His third and strongest line consisting of his regulars, included the Virginian Regiment, Delaware infantry, and the 1st and 2nd Maryland regiments was a further 400 yards further on, though placed at an angle to the west of the road. While superficially resembling the deployment successfully used by Daniel Morgan at Cowpens, the lines were hundreds of yards apart and could not support one another. Since the east side of the road was mostly open, Cornwallis opted to attack up the west side and, following a short barrage of cannon shot on the cannon positions of the first line, at 1:30 p.m., Cornwallis moved his men forward. When they were about 150 yards short of the fence, a volley was fired from the Americans, but the British continued until they were within musket shot then fired their own volley in return. On a command from Webster, they then charged forward, coming to a halt 50 paces from the American lines because the North Carolina militia, as noted by Sergeant Lamb of the 23rd Regiment “had their arms presented and resting on the picket fence…they were taking aim with nice precision”. Urged onwards by Lieutenant Colonel James Webster of the 33rd Regiment of Foot, the British continued to advance. The North Carolina Militia, to the west of the road, fired their muskets then turned and fled back through the woods, discarding their personal equipment as they ran. The British advanced on the second line. Heavy resistance was shown, but Webster pushed around the flank and on to the American 3rd line. The woodland was too dense to allow practical use of the bayonets. The British army forced its way through the first two lines with significant losses. The 71st Regiment, grenadiers and 2nd Guards moved up the center, following the musket shots from the 33rd and 23rd regiments to their left. To the right, the 1st Guards and Hessians were being harried by Lee’s Legion. The British guns and Tarleton’s light dragoons moved forward along the road, keeping pace. The 2nd Guards in the centre found themselves coming out into open ground around the court house to the left of the Salisbury road. They spotted a large force of Continental infantry, and immediately attacked them and captured two six-pounders. They then pursued the Continentals into the wood and were repulsed by Lt. Col. William Washington’s light dragoons, and the 1st Maryland Regiment, abandoning the two guns they had just captured. Lieutenant John Macleod, in command of two British three-pounders, had just arrived and was directed by Cornwallis to fire on the Dragoons and the British alike. The battle had lasted only ninety minutes, and although the British technically defeated the American force, they lost over a quarter of their own men. In a letter to Lord George Germain, delivered by his aide-de-camp, Captain Broderick, Cornwallis commented: “From our observation, and the best accounts we could procure, we did not doubt but the strength of the enemy exceeded 7,000 men… I cannot ascertain the loss of the enemy, but it must have been considerable; between 200 and 300 dead were left on the field of battle…. many of their wounded escaped…. Our forage parties have reported to me that houses in a circle six to eight miles around us are full of others…. We took few prisoners”. After the battle, the British were spread across a large expanse of woodland without food and shelter, and during the night torrential rains started. Fifty of the wounded died before sunrise. Had the British followed the retreating Americans they might have come across their baggage and supply wagons, which had been left where the Americans had camped on the west of the Salisbury road prior to the battle. On March 17, two days after the battle, Cornwallis reported his casualties as 5 officers and 88 other ranks killed and 24 officers and 389 other ranks wounded, with a further 26 men missing in action. Webster was wounded during the battle, and he died a fortnight later. Lieutenant-Colonel Tarleton, commander of the loyalist provincial British Legion was another notable wounded officer, losing two fingers after taking a bullet in his right hand. Greene reported his casualties as 57 killed, 111 wounded and 161 missing for the Continental troops and 22 killed, 74 wounded and 885 missing for the militia: a total of 79 killed, 185 wounded and 1,046 missing. Of those reported missing, 75 were wounded men who were captured by the British. When Cornwallis resumed his march, these 75 wounded prisoners were left behind at Cross Creek, Cornwallis having earlier left 70 of his own most severely wounded men at the Quaker settlement of New Garden near Snow Camp. 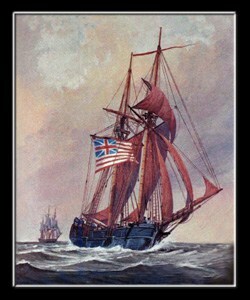 At Wilmington, the British general faced a serious problem. Instead of remaining in North Carolina, he determined to march into Virginia, justifying the move on the ground that until Virginia was reduced, he could not firmly hold the more southerly states he had just overrun. General Clinton sharply criticized the decision as unmilitary, and as having been made contrary to his instructions. To Cornwallis, he wrote in May: “Had you intimated the probability of your intention, I should certainly have endeavoured to stop you, as I did then as well as now consider such a move likely to be dangerous to our interests in the Southern Colonies.” For three months, Cornwallis raided every farm or plantation he came across, from which he took hundreds of horses for his Dragoons. He converted another 700 infantry to mounted duties. During these raids, he freed thousands of slaves, of whom 12,000 joined his own force. General Greene boldly pushed down towards Camden and Charleston, South Carolina, with a view to drawing his antagonist after him to the points where he was the year before, as well as to driving back Lord Rawdon, whom Cornwallis had left in that field. In his main object—the recovery of the southern states—Greene succeeded by the close of the year, but not without hard fighting and repeated reverses. “We fight, get beat, rise, and fight again,” were his words. Every year, on or about March 15, re-enactors in period costumes present a tactical demonstration of Revolutionary War fighting techniques on or near the battle site, major portions of which are preserved in the Guilford Courthouse National Military Park, established in 1917. Recent research has shown that the battlefield extended into the area now within the boundaries of the adjacent Greensboro Country Park to the east. 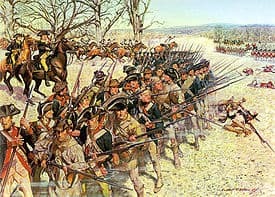 Three current Army National Guard units (116th IN, 175th IN and 198th SIG) are derived from American units that participated in the Battle of Guilford Courthouse. There are only thirty Army National Guard and active Regular Army units with lineages that go back to the colonial era. * In the 2000 historical epic The Patriot, the final battle was inspired by the battles of Cowpens and Guilford Courthouse. The Americans used the same tactics in both battles. In the film, the name of the battle, as well as the winning side, was taken from the Cowpens battle. The sizes of the armies, as well as their being led by generals Greene and Cornwallis, come from the Guilford Courthouse battle. The scene where Cornwallis orders his artillery to “concentrate on the center,” during which they killed both Continentals and his own troops, took place at Guilford Courthouse.